'Anciently...every suitor was obliged to appear and prosecute or defend his suit in person unless by special license of the King; and this still continues to be the rule in criminal cases. But by sundry old statutes... permission was granted to attorneys to prosecute or defend any civil suit in the absence of the parties. John, the father of famous Ashburtonian John Dunning, was an attorney. ** Henry Jutsham according to Charles Worthy, Devonshire Parishes, op cit. p 73. Marriage licence said to be 17th May 1726. ADM 106/1077/118, is a letter to or from John Hicks, attorney, Ashburton, detailing Amos Mallett and Prudence Webb's trial for embezzling naval stores. In 1756 John Smerdon was an apprentice to Richard Harris of Ashburton, attorney. In 1767 Robert Brent was an apprentice to Richard Harris, gent. 1769 John Seale and in 1777 Robert Abraham were apprenticed to Richard Harris attorney. Richard may have been the same Richard Harris who left a charitable bequest in his will of 1778 (see the Rich and poor section of People and properties). In 1774 Thomas Soper was apprenticed as an attorney to John Edmonds of Ashburton. In 1780 both John Rowe Southmead and Rob Abraham were apprenticed to John Edmonds. A memorial on the wall of St Andrew's Church commemorates John Edmonds, who died 10th August 1808, aged 63 years. He was an attorney. The death of John Smerdon, attorney, at Ashburton, was reported in 1817. He may be the same John Smerdon who was apprenticed to Richard Harris, above. In 1783 Vincent Langworthy was an apprentice to Thomas Tucker of Ashburton, attorney. 1761 The banns were read in March for the marriage of Solomon Tozer of Ashburton and Catherine Wreford of Bow. 1767 Moses Tozer, the son of Solomon Tozer and his wife Rebecca, was baptized in May. 1783 John Tozer, sergemaker, was buried on April 27th. 1817 A 'substantial' property in West Street occupied by Solomon Tozer is up for sale. The house had two parlours, a drawing room, a kitchen, 7 bedrooms, a wash-house, scullery, pantries, drying lofts and a pump. This is probably the same Solomon Tozer who died aged 48 in 1819, and was buried in Ashburton on 19th May. The burial record states that he was an attorney. In 1819 the Exeter Flying Post printed a notice regarding the estate of the late Solomon Tozer, attorney-at-law at Ashburton. Anyone with a claim on the estate was to contact Mr R M Tozer of Newton-Abbott or Mr J C Tozer of Teignmouth. 5th March 1821. Solomon Tozer married Mary Rendell by licence at the bride's parish, Stokeinteignhead. Solomon was of the parish of Ashburton. 1823 Solomon Tozer, the son of Solomon Tozer and Mary, was baptized on April 30th. Solomon was a sergemaker. The 1861 census of Ashburton shows Henry Tozer, solicitor, living in East Street. With him is his wife Harriet A, his daughter Harriet M E, and his son Solomon. Henry was probably the son of Solomon and Mary Tozer, born 9th August 1829 and baptised in Ashburton on 6th January 1830. The Devon Family History Society index shows Solomon as a sergemaker. Solomon and Mary may be the same couple of that name living at Abbey View in the 1861 census. Solomon is still there in 1881, aged 89 and describing himself as a retired sergemaker. He was born in Somerset. 'Henry Tozer was the youngest son of Solomon Tozer, a member of an old Ashburton family, long connected with the woollen manufacture. He was educated at the Ashburton Grammar School, and entered the legal profession about forty years since, having served his articles with the late Mr Edgar, of Weston-super-mare. He took an active part in local matters, and his genial and generous nature made him a popular man. For many years he had the management of Spitchwick and Widecombe Manors, then in Chancery. For some time Mr Tozer had withdrawn from public business, and his son and survivor Mr Solomon Tozer, having entered into partnership with him, he devoted himself to his garden and other kindred pursuits. Mr Tozer joined the Association in 1872, and the success of the meeting at Ashburton in 1876, was largely due to the active interest he took in the arrangements, and to his liberal hospitality on the occasion. He was also one of the early members of the Teign Naturalists' Field Club, having been elected in 1865. Early in life he married Harriet Goodhall*, who died in 1884 leaving a son and daughter. Early in 1893, Mr Tozer moved into his country house at Priestaford, near Ashburton, where he died suddenly on the 27th August, at the age of 64. In 1814 a dwelling house was to be let in Newton Abbot, as was a house in Shaldon and a cottage in Bovey Tracey. Particulars could be obtained from various people, including Mr Gribble, solicitor, Newton and Mr J Gribble, solicitor, Ashburton. For more on this see the Conflict section of Ashburton in peril. When parts of a phaeton belonging to Mr Thomas Cousins were stolen from a coach house in East Street, five guineas reward was offered for the conviction of the culprits. Application could be made to Mr Joseph Gribble, secretary and treasurer of the Ashburton Association for the prevention of robbery and theft. On 30th October 1835 a fiat in bankruptcy was issued against Joseph Gribble of Ashburton*4, scrivener. He lived somewhere in West Street. Later that year (1835) the property, 'late and for many years in the occupation of Mr Joseph Gribble' was up for auction at the London Inn. In 1851, 76 year old Joseph Gribble, coroner and solicitor, was living in West Street. A widower, his 3 unmarried daughters and one unmarried son were living with him. The 31 year old son, Arthur M Gribble, was a dissenting minister. In 1777 Robert Abraham were apprenticed to Richard Harris attorney. 1785. John Gillett was an apprentice with Robert Abraham jnr., attorney, as was Henry M. Lyde in 1789, Joseph Gribble in 1790, Jonas Ridout and John Henry Pinker in 1795 and Charles Kendall and Jas N. P. Cosserat in 1800. October 1827. Robert and Frances Abraham baptize their daughter, Sarah Mary. Robert is described as a solicitor. In 1830 Robert Abraham jnr., solicitor, of Ashburton, was killed in a riding accident. 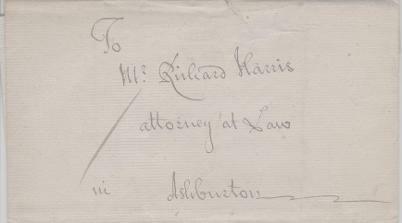 Articled clerks who passed their examination at the Hall of the Law Society, Hilary Term 1841: Robert George Abraham, articled or assigned to Robert Abraham, Ashburton. In 1844 The Exeter and Plymouth Gazette noted that in the Register of Attornies and Solicitors several men had been practising between 59 and 64 years. The solicitor in third place for length of service was Robert Abraham of Ashburton, who was admitted in 1782. He died aged 86 in 1847. The North Devon Journal reported that he was then the oldest solicitor in the county. 1908. The death of Robert George Abraham, solicitor, was announced. He was in his 90th year. In 1845 'the lady of George Caunter Esq., solicitor', gave birth to a daughter. For more on George Caunter see the Caunter family under People and properties. The 1851 census shows 76 year old Joseph Gribble as a solicitor and coroner, living in West Street. When Joseph Gribble died in 1852, a vacancy occurred for the post of coroner. W A Cockey, solicitor, had been deputy coroner for some time, and was a candidate for the position. Solicitors in the 1861 census: Robert Tucker, Robert C Tucker, Robert G Abraham and Henry Tozer. This is possibly Robert Dobell, who in the 1861 census was the 14 year old son of Robert Dobell, a solicitor's managing clerk. At the time Robert was living with his parents and 6 siblings in East Street. 1874. H. Tozer, solicitor, Ashburton, advertised that he would advance sums of money – £1500 and £700 is given as an example – on freehold and approved leasehold properties. Born in Cheshire, Henry Mallaby Firth was baptised in Wittan in 1852, the son of Frederic Hand and Mary Firth. He was an articled attorney clerk in Lewisham in 1871. In 1875 Mr Firth, son of F A Firth of Cator Court, went into partnership with Mr G Caunter, of Ashburton. He married Frances Caunter in Widecombe parish church in 1877. At the time of his marriage his residence was Cator Court, Widecombe. Frances was the daughter of solicitor George Caunter. Henry Mallaby Firth died, aged 74, in 1926. He was lord of the manor of Ashburton, a governor of the Grammar School and trustee of the church lands amongst other roles. In 1896 Captain S Tozer, solicitor at Ashburton, died. He was chairman of the committee for the Constitutional Club, a retired Major of the Ashburton Company of Volunteers, a one-time churchwarden and governor of the Grammar School, and the first secretary of the Ashburton Building Company. He had also been Portreeve.